To those of You waiting for the iPhone firmware 2.0.1, Well it is now available for download. I do hope that there will be no problems such as crashing apps, interminable keyboard delays, choppy scrolling and others. Although there are already reports of having problems with some applications. 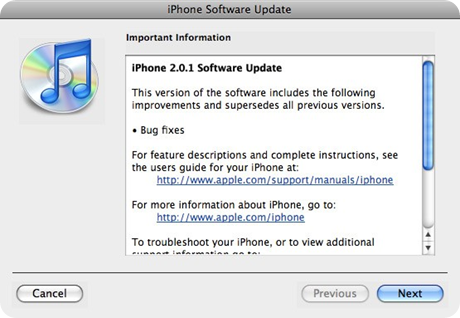 iPhone 2.0.1 software (249MB, build 5B108) can be get via the Update feature in iTunes (iPhone > Summary > Version). Julers last blog post..Lessonko.ws powered by Ipower!